Monday 28th August was a bank holiday in the UK and in true offshoring tradition, having worked on Freedom Day (celebrating the first full election), Youth Day (commemorating the children’s uprising in Soweto which I’ve already told you about) and Women’s Day (commemorating an all-women march to the Houses of Parliament to protest about the passbook system which required black people to have passes to enter white residential areas to show they had ‘permission’ to be there) I wasn’t at work when the rest of the country was!! So, I took the opportunity for my 6-monthly haircut and teamed up with a colleague, Oscar, to explore some of the smaller things in Gauteng. First he took me to Catz Pyjama’s, a restaurant/cocktail bar in old Melville. Melville is the sort of equivalent of the King’s Road in London a few years ago, or Hoxton Square these days – lots of bars, restaurants, antique shops, bargain stores and second hand places. Catz had been the really ‘in’ place to go few years ago and for many people still is the place to start a good night out in Melville. As we went there for lunch, we limited ourselves to a water and a Coca-Cola to go with our food rather than trying the myriad of cocktails on the menu. We then headed out of Jo’burg towards Magaliesburg. 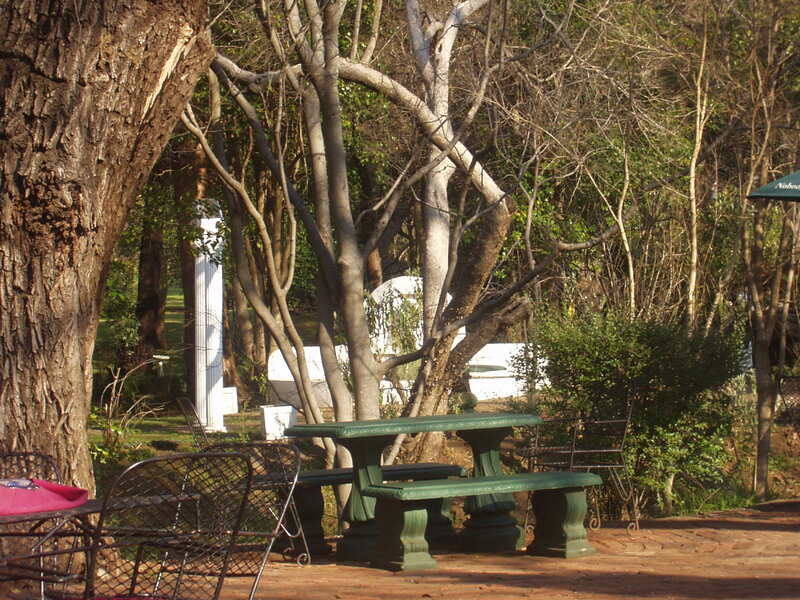 I’d heard of Magaliesburg on a number of occasions, it is a small resort town to the north-north-west, quite close to the city, but out in the country. There really isn’t much to the town itself, especially if you choose to not count the myriad of restaurants, lodges, wedding venues and other businesses catering to visiting tourists. The villages sits at the foot of the Magaliesberg mountain range, and isn’t that far from Kroomdrai, where Kelly and I had been to see the animal reserve. The whole area has been populated by humans for probably the longest time anywhere on earth. In and around the Sterkfontein Caves, about 20 minutes drive from Magaliesburg village, the remains of the earliest species of primitive man know today were discovered. Since then, many people have visited the area, famously Queen Elizabeth II travelled to Magaliesburg from Jo’burg by train, complementing the gardeners on the wonderful flora in the area. Much is still brown and dry at the moment, as the water table hasn’t risen much from its low winter level. We did have some quite severe rain last week, more like monsoon rain than any rain I’ve experienced in the UK, big heave drops and an instant soaking to the skin on stepping outside for 5 seconds. Until the rains start coming more regularly (I’ve been told once a day, at the same time of day like clockwork) in the summer, much of the plant life will not become much greener than it is at the moment. We stopped for tea at Wickers, a famous tea-garden which, like Catz Pyjama’s was practically empty it being a normal week-day here. One of the reasons Oscar and I went out towards Magaliesburg is that he grew up in the area, and his parents still live on the farm on which he grew up. Oscar had told me about their tortoise collection, the donkey and the large bird collection. As we drove up to the gate, I realised the menagerie also included 10 dogs of various sizes and breeds! They included a St Bernard, a Weimaraner, a Labrador and I didn’t recognise the other breeds, they were all different though. Oscar’s parents run a tortoise sanctuary and welcome any abused or unwanted tortoises onto their land. We wandered round to find them and found an enourmous one by my standards, around 50cm long and 30cm high. Oscar nudged her a bit for her to come out of her shell and she hissed! I didn’t realise tortoises make noises, this was a very loud hiss, not dissimilar to hissing geese, just without the other goose noises of course. Oscar then also showed me how you can tell the gender of tortoises – which is common sense really when you think about it. Females’ bottom shell is completely flat, whereas the males have an indentation at the forward end of their underside which allows them to mate. His father runs a small foundry and does bits and pieces of wood and metal work as well as traditional sand-based die-casting, spending a fair amount of his time re-building old cars. At the moment he is working on a Singer car, which raced at Le Mans in the 1930s and apparently clocked 98 mph at the race. For a car built in the 1930s that is quite a speed, especially as Singer is more famous for its sewing machines, I didn’t realise they also built cars. He is re-building the wooden frame and will then work on the metal body. There are a number of shells of old cars on the plot and I started swooning over the various 1930s and 1940s cars which are still work in progress.